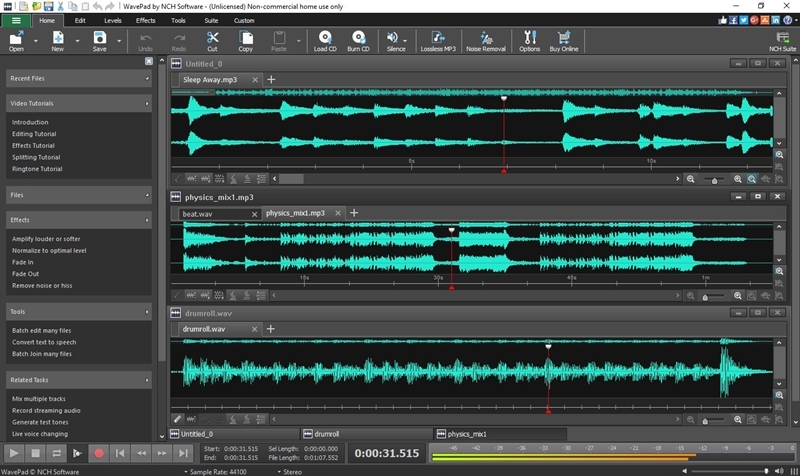 WavePad Pro is a professional audio and music editing software for Windows. With the easy-to-use interface, simply drag and drop one of the many audio file formats that WavePad supports, like wav, mp3, vox, gsm, wma, real audio, au, aif, flac, ogg, and many more. Extract audio from movies or create your own sound files by recording from within WavePad. If you are looking for a new sound, use the royalty free NCH Sound Library. Clean up your tracks by cutting them and using other editing tools, like trim, silence, join, mix, duplicate and many others. Control levels by applying compress, normalize, envelope and other leveling tools. Customize your audio clips with fun effects, including: wah-wah, echo, doppler and vibrato. To perfect your music, clean up your audio tracks with noise reduction and click/pop removal or change the pitch and speed. With WavePad Pro, you can create a ringtone or convert text to audio with the Text-to-Speech feature. When you?re done, upload your masterfully created music directly to DropBox, SoundCloud or Google Drive or save in one of the many file formats available. WavePad is the perfect professional recording studio and music mixing software to create audio and music tracks you can be proud to share with your audience.